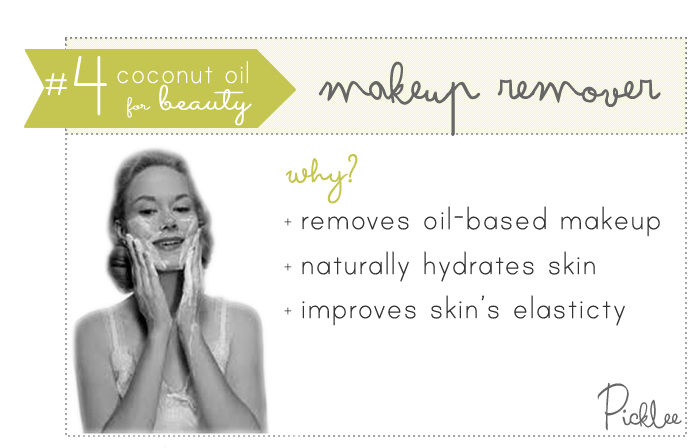 Apply coconut oil directly to skin for it’s incredible healing & hydrating properties. Coconut oil has natural SPF protection (approx. 4 SPF) & it helps protect skin from free radicals. 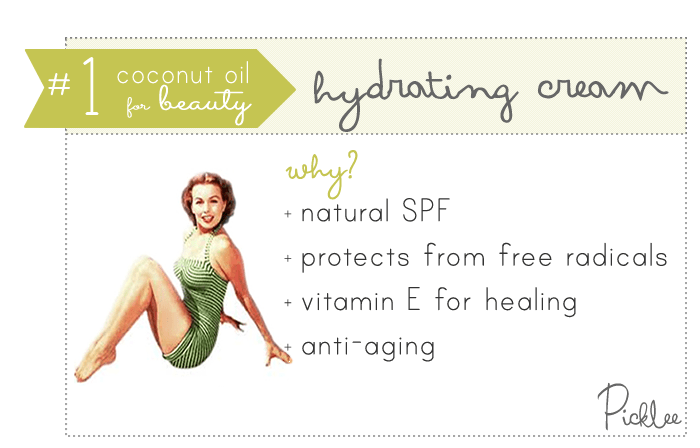 Coconut oil penetrates deep into skin tissue for intense hydration, helping to firm & brighten skin tone. It’s also packed with vitamin K & E, which have properties that help protect skin from pre-mature aging. 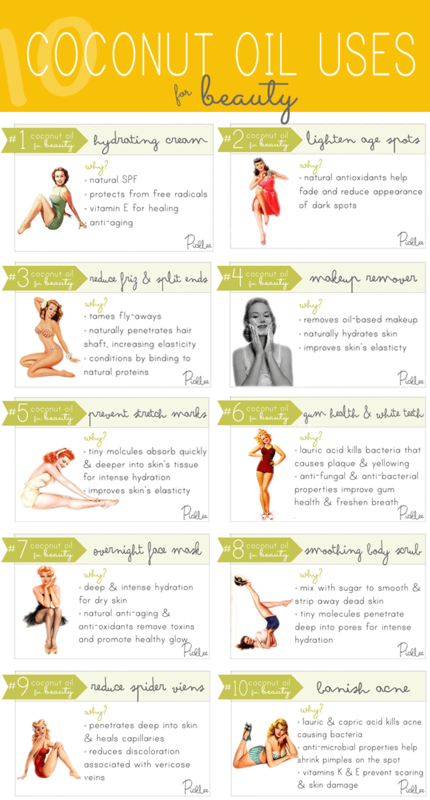 *Apply it to your lips for a natural chap stick too! 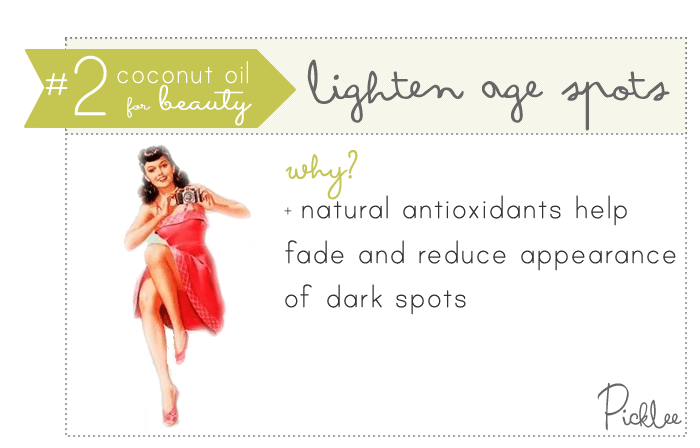 Apply coconut oil to dark marks, scars & age spots to help lighten them and reduce their appearance! The natural vitamins in coconut oil have intense healing properties for skin. Rub a bit of coconut oil between your palms and apply to friz & fly-aways to keep them at bay! Use a little coconut oil along with your regular conditioning treatment, it naturally penetrates the hair shaft, increasing elasticity & leaving hair super smooth. Use coconut oil to naturally remove makeup and rid skin from the day’s toxins. Coconut oil does double duty as it hydrates skin & increases elasticity, revealing a brighter complexion. 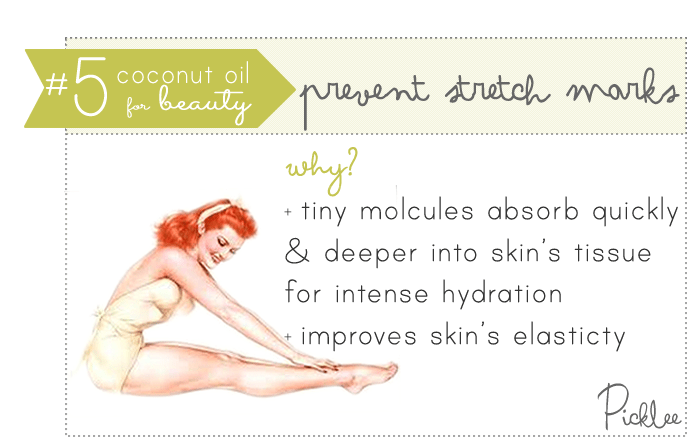 Use coconut oil to prevent & reduce stretch marks associated with pregnancy! Coconut oil is made up of beneficial nutrients & tiny molecules (smaller than any other oil), which allow for faster & deeper absorption into the skin’s tissue. Vitamins and natural acids in coconut oil improves skins elasticity, which helps to prevent stretch marks. Coconut oil contains lauric acid, which battles against bacteria that causes plaque & yellowing. Brush your teeth with equal parts baking soda & coconut oil for whiter teeth and improved gum health. 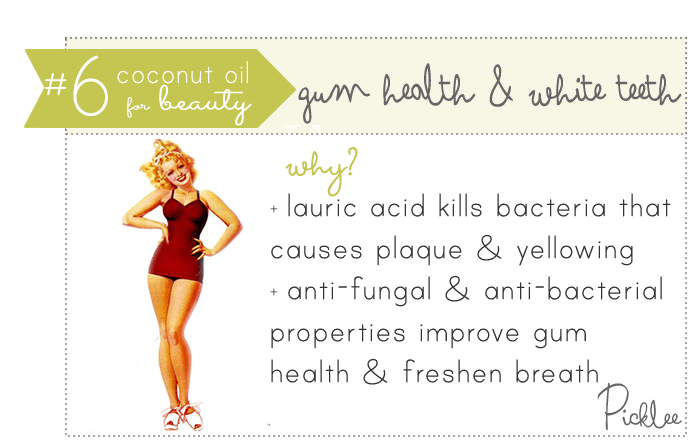 Coconut oil also contains anti-fungal properties that naturally freshens breath! * I’ve personally experienced significantly whiter teeth by “swishing” coconut oil (aka “oil pulling”). Read about my experience with coconut oil pulling here. 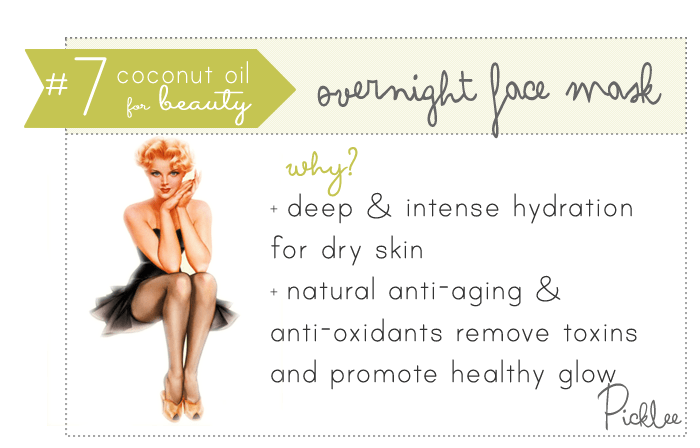 Apply coconut oil to your face before hitting the hay, you’ll wake up with smooth, glowing skin! Coconut oil is a natural detox. Vitamins K & E protect skin from aging, help keep it hydrated, and reduce fine lines & dark spots. Mix equal parts coconut oil & sugar and apply to your body in the shower. 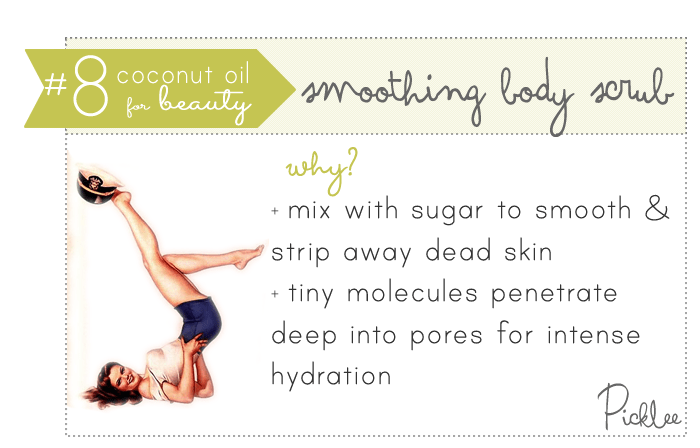 The sugar and coconut oil work together to soften & buff away dead skin! 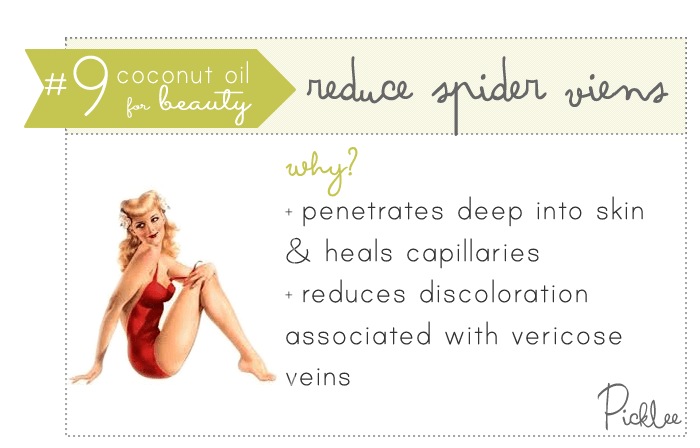 Apply coconut oil daily to spider veins & watch as their appearance is drastically reduced. The tiny molecules in coconut oil are able to penetrate deep into tissue and heal broken capillaries. Apply coconut oil to skin at night to help reduce acne breakouts. 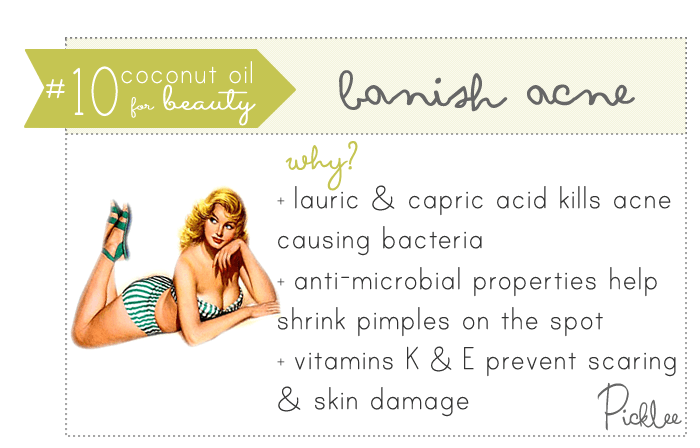 The lauric & capric acid penetrates skin, killing acne causing bacteria. Use coconut oil as an acne spot treatment too; it’s anti-microbial properties will help shrink pesky pimples. Vitamins K & E also help prevent and reduce scaring & skin damage due to acne! what kind of coconut oil r we talking about and where do we get it?? Walmart carries an excellent brand-Luanna. $5.99-$6.99 for a qt. jar. Sounds like great ideas for coconut oil but, there are no measurements or time factors. well try to use veno rid serum which is help you to get rid varicose veins I have also used the product for 4 weeks and have not seen any disappearance in spider veins. Actually, they are more pronounced after applying the cream. I will finish the product in about 6 weeks to see if there is a gradual improvement. Coconut oil is amazing, but I would use caution when putting it on your face for a moisturizer or acne treatment. Many people have been known to break out from coconut oil (myself included) so a patch test is recommended. I know it works on my fine, thin hair – it makes it soft and controls fly-aways. I also just started to use it on my skin. I noticed my spider veins have greatly improved. I didn’t know what to associate it with – maybe it is the coconut oil! If so, I am very impressed. I have read that unrefined coconut oil is what you want. Just read the label on the jar… I find it at the health food section of my food market. I am amazed by the benefits of coconut oil. I found out by accident how well this works on spider veins. I had been using it on my legs because my skin was so dry. I happened to take a closer look at my calves and thighs and was happy to see the clumpy little veins almost gone or very much diminished. It doesn’t take long to see improvements. I was actually looking at dermatologists in town to take care of this, but it doesn’t look like I’ll have to. Learn a lot from you. Coconut Oil is great for cooking too. How many weeks does the marks take to go??? What are the measurements for the mixtures?